My first encounter with Zach Braff was last year’s feature film Garden State, which he wrote, directed, and starred in. The rest of the world, though, knew him from an NBC sitcom called Scrubs. Now in its fourth season, Scrubs is finally available on DVD. Today sees the release of the complete first season, and I’m finally beginning to understand its appeal. Scrubs is filmed in a (former) real hospital. Braff stars as medical resident J.D. Dorian. The pilot episode shows us his first day at Sacred Heart hospital, where he shares the thrills and stresses with his friends Chris Turk (Donald Faison), a surgical resident, and Elliot Reid (Sarah Chalke), J.D.’s fellow internist. Sent apparently to torment the residents are the hospital’s senior staff, Dr. Kelso (Ken Jenkins), who isn’t nearly as hip as he likes to think, and yet whose power is absolute; and the fast-talking, insult-spewing, yet somehow decent Dr. Cox (John McGinley), who single-handedly raises Scrubs above mere sitcom silliness. Actually, that’s not entirely true. There are several angles that make Scrubs better than your average sitcom. For one, it has no laugh track (if it did, this household wouldn’t have made it past the first artificial guffaw). For another, it spends a good portion of its production budget on fantasy mindscreens and flashbacks. When J.D. feels like a deer caught in the headlights, we jump cut to him on a lonely dark road, with antlers, facing an oncoming truck. If everyone has to dress like characters from Fat Albert or Happy Days for a two-second insert, then Scrubs does what must be done. Finally, Scrubs acknowledges the human tragedy, absurdity, and horror that doctors see working at hospitals. A very early episode, My Old Lady, is a moving piece of television, more drama than comedy. The horrible and disgusting aren’t too often trotted out, thankfully, although if the writers can make comedy out of it, they’ll go for it. You’ll thank me for not explaining what “the lost and found box” actually contains. The 3-DVD set has some great design and packaging. A plastic slipcase includes a transparent “x-ray”of the cover art, held in place by an x-ray viewer. Inside, the x-ray motif is continued, and three DVDs are held in place in a folder that usually only has room for two discs. The neat packaging makes you feel like you’re getting a good value for your $35. The bonus features are not so well thought out. The extra features are listed on the package, but there is no telling which features are on which disc. It may be fun the first time through to see what’s where, but ultimately, it would be better not to have to guess. The features themselves are a mixed bag. Some of them are absolutely essential, like the interviews with creator Bill Lawrence and his friend Dr. Doris, the real-life J.D., whose stories provided inspiration for many of the episodes. Other features, like the audio commentaries, are almost a waste of time. Braff and Lawrence provide some of the commentaries, both sick with the flu. They admit that they are unprepared, that they are watching these episodes for the first time in years. Their ramblings turned me off after only a few minutes. In addition, you can find the usual set of interviews, deleted scenes, gag reels, and alternate takes. Most of these are run-of-the-mill, and none of them seems essential, although the music video (directed by Braff) for the theme song “Superman” is satisfying. The theme is so short in the episodes (15 seconds, maybe?) that you almost feel sorry for Lazlo Bane, who wrote such a catchy song, only to have it be hacked to the bone. The DVD transfer is very good, and the surround sound is pristine. But there is a distracting looseness about the color and exposure, as though the show were filmed with an overly sensitive automatic aperture. But without doing more research or checking the colors on different monitors, I probably can’t pinpoint the source of annoyance. For this movie lover, a lot of TV goes by unnoticed. Occasionally some show will be put in front of my face, and even less frequently, it will be something I’m happy to watch. Scrubs is not perfect; it sometimes suffers from the shallowness of the medium, or from the rush of the production schedule. But it’s a series that I’m glad to finally see on DVD. 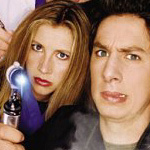 Let’s hope Buena Vista stays loyal to its Scrubs fans and releases the rest of the Scrubs seasons on DVD.